"The CIA is trailing them, the KGB is tracking them, the phone company is tracing them, the police are chasing them, the cowboys are herding them, and the Indians are hunting them. Are they going to fall for all of that?â€"
Outrageous Fortune tells the tale of two women who are polar opposites and have virtually nothing in common, except for the fact that they are sleeping with the same man -- and don't know it. When he appears to die in a explosion, they both refuse to believe it and set out to search for him. It soon becomes clear, however, that his death was faked, and after the two women are forced to team up to stay alive, they find out they had a lot more in common than they knew. 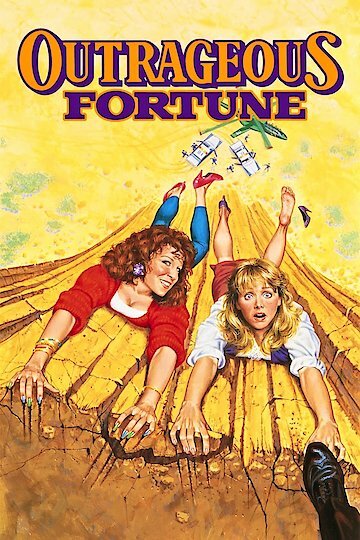 Outrageous Fortune is currently available to watch and stream, buy on demand at Amazon, Vudu, Google Play, FandangoNow, iTunes, YouTube VOD online.